Handmade at Mahinani's Native Hawaiian Neem Tree Farm, Anahola Kauai Neem oil is made from the oil pressed from the seed the Neem tree. The seed is about the size of a coffee bean. Neem Oil has been used for generations as a natural skin remedy. It is highly concentrated and has anti-microbial active ingredients that can be used directly on cuts, scrapes or other skin conditions. Much research has been done regarding the benefits of Neem. One of Neem's stronger advantages is its effect upon the skin in general. It has been most helpful in treating a variety of skin problems and diseases including psoriasis, eczema and other persistent conditions. 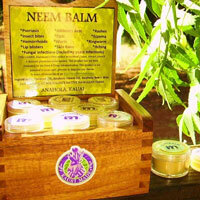 Neem oil moisturizes and protects the skin while healing the lesions, scaling and irritations. Coal tar products are messy and smelly and cortisone can thin the skin when used repeatedly. Neem has neither side effect and can be used for extended periods of time. We combine our Anahola Neem oil with Coconut Oil and our honeybee's wax to create a wonderful balm that is easy to apply and convienient to carry & have on hand at all times. Copyright © 2010-2019 Mahinani’s Incorporated. All rights reserved.